Apparently, Mr Gray had been refused planning permission, by Southwark Council, to build on his plot of land and felt aggrieved by the decision. 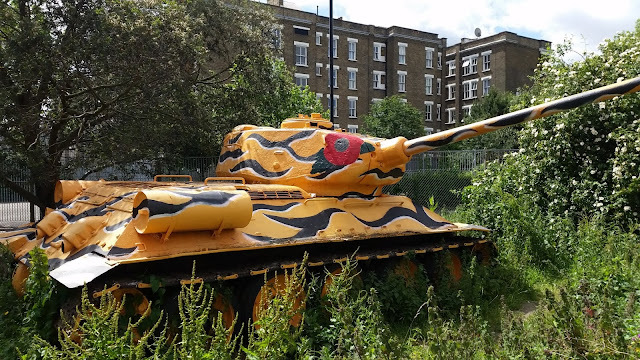 However, he applied to Southwark Council to see if they would grant him permission to place a tank on the land. Mr Gray never specified, to Southwark Council, what sort of tank he wanted to place on the land, but they still gave him the permission he required, believing that we was placing a septic tank on the site. Russell Gray, who lives just a few yards from where Stompie now resides, had bought the T-34 Tank for £7,000. I would have loved to have seen their faces when Stompie arrived, with the turret pointing its gun directly at the council offices. Mr Gray has allowed Stompie to be painted, and graffitied, by various artists, over the years.